PlusKits.com - The Ultimate Increase In Intelligence Booster Hypnosis NLP CDs. Need a way to increase your IQ naturally? A method that starts working right away and with unbelievable results? Let Intelligence + help you boost your brain power the easy way! No more slow thinking, uncertainties or naiveties. Intelligence + uses the most advanced scientific techniques to help you rewire your mind and get the most from your mental abilities. Through a combination of NLP, hypnosis and brainwave stimulation, Intelligence + will have you thinking faster, smarter and better than ever before. Simply sit back and listen as the soothing musical soundscapes help you relax and stimulate your thinking. How long does it take to increase your intelligence? With Intelligence + you’ll start to feel the benefits in less than 60 minutes. Old habits will fade away as your intelligence levels soar beyond your expectations. • Learn to think on your feet. • Be the envy of all your friends. • Enjoy being quick-witted and full of knowledge. 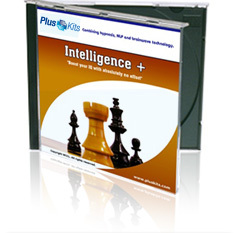 Purchase Intelligence + TODAY and develop the super intelligence you've always dreamed of!